Discusses the physical characteristics, habitats, and behavior of animals that fly and the flightless birds classified as ratites. Grade 2-4&#x2013;Like Amazing Animal Defenses, this series presents groups of animals rather than zeroing in on individual species. 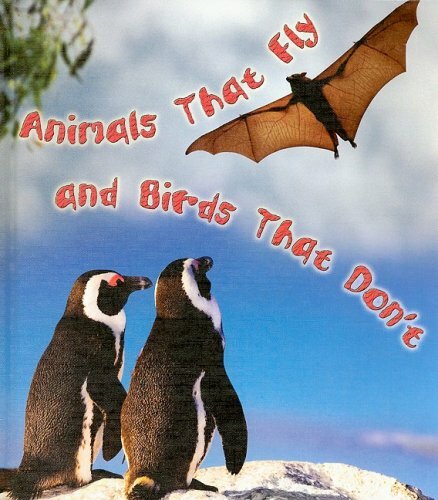 There is surprisingly little overlap overall, though the ostrich, for instance, makes appearances in <i>Animals That Fly</i> and <i>Speed Demons</i>, and antelopes are included in both the latter book and in <i>Leaps and Bounds</i>. Along with plenty of bright nature photos, the visual appeal is further cranked up by inviting page design, which features plenty of open space and enhancements like a running top border of dripping blood in <i>Blood Suckers</i>. Aside from <i>Freaky Faces</i>, which is more for browsing, the volumes will support assignments beyond the conventional single-animal topics, and the information is briefly presented but specific enough to provide a basic stock of hard facts. <br />Copyright &copy; Reed Business Information, a division of Reed Elsevier Inc. All rights reserved.